The word Franciscan refers to followers of one of the religious orders that follow the Rule of St Francis. 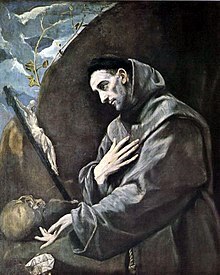 Saint Francis of Assisi lived in the 13th century. Franciscans usually lead simple lives without much money. Today, there are three main branches of these orders. They mostly see themselves as part of the Roman Catholic or Anglican Church. There are also small communities in the Old Catholic and Protestant Church. This page was last changed on 10 February 2018, at 21:20.